Description: "Mr. I don't know where I am going". SF Bluebonnet 2628 GP35 along wiyh BN GP38-2 #2366. This train backed up, came back, picked up many different kinds of cars. Description: After changing crews, two Geeps sit idle at NorthTown. Description: 2366 idling after shunting some flatcars in the industrial areas of downtown Portland. Description: Three Geeps prowl up to the T Yard with a ballast train. Title: PNWR3003 Leading a train past Willbridge Yard office. 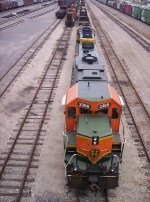 Description: Geeps in the Heritage I scheme switch Spokane Yard, as seen from the Fancher Road overpass. Description: Had to use my f1.8 50mm lens because of the low light at 5:30 am, but the slow shutter speed and shallow depth of field gave this shot a somewhat soft focus. Too bad. Description: Best BNSF paint scheme. Description: the roadswitch runs light to Becker, passing the last BN signals in the area.